Imagine the following scenario: you have $10 to spend on Yarn at a flea market, and at the flea market you go to there are 10 balls of yarn for sale for $2. You purchase all of this yarn, and you have $8 remaining, so you go to the flea market next door - to your surprise there are only 20 balls of yarn for sale there for your remaining $8. This is a bit of a ripoff, since you got 5 balls of yarn at the first market for $1, and here all of a sudden you're getting only 2.5 balls of yarn for every dollar you spend. Say that you get suspicious and you decide to ask your friend at the other flea market to keep track of the price of yarn. It stays perfectly still until you spend your $10 at the first flea market, and shortly after you buy yarn at the first flea market the price at the second flea market shoots up dramatically. You eventually realize that one of the people selling you a ball of yarn at the first market is calling his friend at the other flea market saying "hey, there's some dude here that wants to buy tons of yarn", and that guy buys all of the yarn on the second flea market and immediately puts it up for sale, raising the price. He sells it to you once you arrive, and escapes the flea market having taken zero risk and, effectively, having ripped you off because he knew you wanted to buy yarn before you ever arrived at the second flea market. Enter the world of High Frequency Trading. I was recommended this book by a coworker - I started working at the MIAX options exchange in late October, and one of my colleagues pointed me towards this book as a referential text for how important latency is to the industry. Although an industry novice, I found this book to be extremely instructive for how the world of finance operates. I would consider this a good introduction to the "new tech world" of finance, and how important even extraordinarily small timeframes are when the winner of a trade is determined by chronological order. 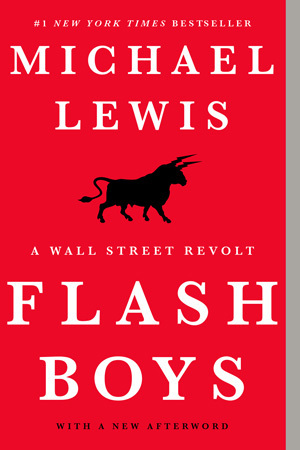 Broadly speaking, this is a collection of anecdotes about the rise of high frequency trading in the US Stock Market, and I think a pretty engaging one - it would be pretty easy for a book like this to be dry and densely theoretical, but Lewis manages to juggle an interesting narrative throughout the book which made it a relatively quick and interesting read. Almost all of the terminology is explained, and I almost wish that I had read it sooner (although I think I likely appreciate it more after working in the industry a little bit). Similar to Fire and Fury, this book suffers from what I believe to be an idealistic picture written into what is likely a more reasonable reality - in particular Brad Katsuyama and IEX in general is portrayed like superhero-type vigilantes of the finance industry, and are never criticized in the entire book. The book seems to insist that US financial markets are rigged and it does seem to be a bit overly simplistic in its portrayal of "good vs evil", and I maintain a bit of skepticism that the narrative is truly as clearly defined as it is written in this book. Likewise, amidst the somewhat strong storytelling were a few things that slowly grew annoying to me; the best example is probably the constant comparisons to the length of an eyeblink, which grew tiring as I read through the book. It's a comparison he makes roughly ten times in this relatively short book, and it's one that is generally pretty annoying after a while (we get it, nanoseconds are very fast). Either way, a fun read into the more technical side of the financial sector (the part about order types was perhaps slightly overblown but as a QA person in an options exchange I sympathized with quite strongly), and one that I would easily recommend to someone not very familiar with the financial sector, and one that I might adjust to and from 3/4 stars because of how borderline it is (I'd give it 3.5 if goodreads allowed half-stars, I'd consider it a decidedly above average book but perhaps not quite to my 85th percentile standard for 4 stars). "All that one needed to discover the truth of the tower was the desire to know it"
Sign into Goodreads to see if any of your friends have read Flash Boys.